Some decoders allow you to change the function assigned to each set of output wires (or pads). 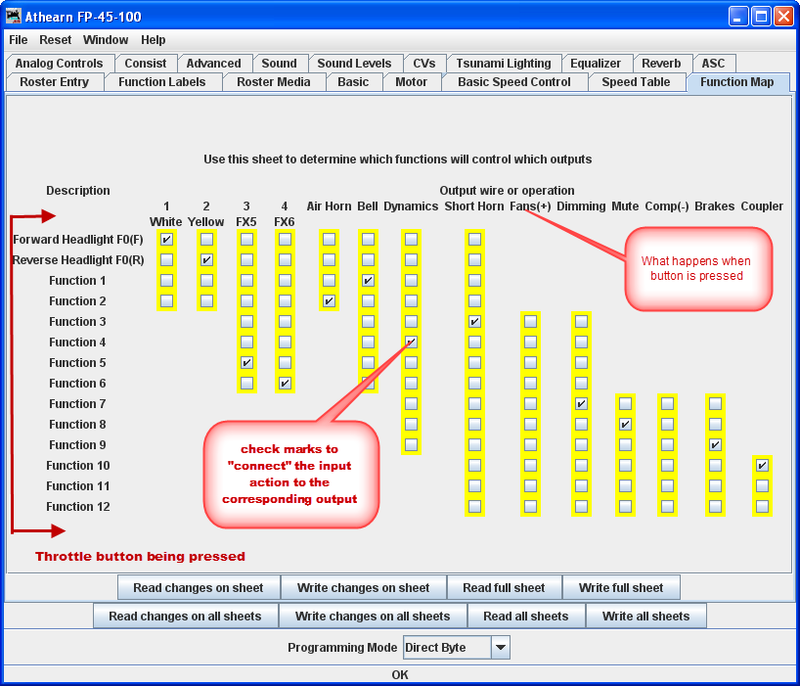 Multiple choices for function assignments are shown by several check boxes. This is more common in decoders with more than four functions, and in sound decoders. Some of the new sound decoders may have up to 28 functions, and your throttle may have a limited function capability. So, here's your opportunity to pick which ones you can operate from your throttle. When this capability is present, the check boxes as shown in the window below are active and allow you to choose to which function key on the throttle each output responds. If a checkbox is dimmed that indicates that no changes in function assignments are possible. Not all decoders allow you to remap the functions and others have very limited functions. Only remap functions if you are sure you know what you are doing.